The album viewer opens in a separate window. This is the interface that your visitors see when you share and publish your albums. Back Go back to previous album. Refresh Refresh the content windows. Open Open the selected item. For albums, this opens the album. For images, this opens the image in the image viewer. For other media files, this opens the file in the media player. Link Display the URL or the HTML code for the selected file. Use this URL or HTML code if you would like to share a single file rather than the whole album. Download Download the selected file(s) to your computer. Select your preferred language for the interface from the drop-down list of available languages. This setting is only available for visitors. If you are currently logged in as a user of the network drive, please go to Applications > System Appearance > Language to change the language. Select how the files are displayed. Slide Show Shows content as slide show. Cover Flow Shows content as cover flow. Cooliris 3D Wall Shows content on a 3D wall with help of the Cooliris plugin. To see all the available views (6), make sure to open an album first, otherwise, only the standard views (3) are available. Logged in users: All your own albums as well as any albums that have been shared with you by other users. All the commands in the toolbar are also available in the context menu when you right-clicking on a file in the content window. View Select how the media files are displayed. Slide Show: Displays the content as slide show. Cover Flow: Displays the content as cover flow. Cooliris 3D Wall: Displays the content on a 3D wall with the help of the Cooliris plugins. Image Set as Wallpaper: Sets the selected picture as temporary wallpaper for the album viewer. Description Edit the description of the selected file or folder. Select the file, right-click on it and choose Open from the context menu. 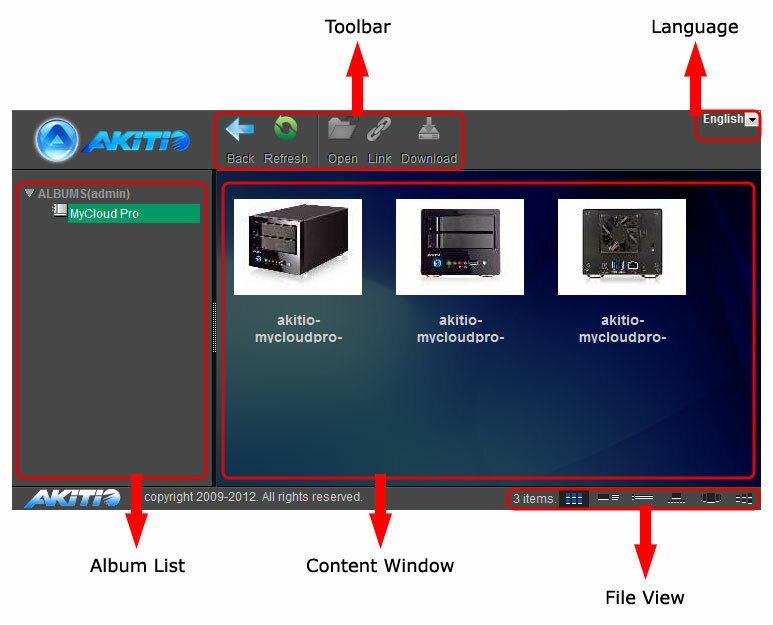 For images, the files open in the image viewer. For other media files, the files open in the media player. If you would like to share a single file rather than the whole album, you can copy the hyperlink to the file and post or share the link to only the selected file. Select the file that you would like to share in the content window. Click Link in the toolbar or right-click on the item and select Link from the context menu. Copy the link and post it on Twitter, post it on Facebook or send it to your friends by e-mail. Copy the code and post it on your blog article or webpage.